IEEE 802.1Q is one of the VLAN tagging protocols supported by Cisco switches. This standard was created by the Institute of Electrical and Electronics Engineers (IEEE), so it an open standard and can be used on non-Cisco switches. To identify to which VLAN a frame belongs to, a field is inserted into the frame’s header. An example will attempt to clarify the concept. Let’s say that we have a network of 2 switches and 4 hosts. 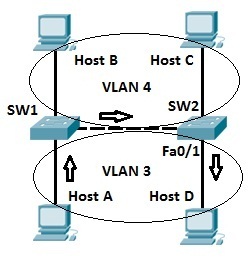 Hosts A and host D are in VLAN 2, while hosts B and C are in VLAN 3. On the segment between two switches, a process called VLAN trunking is used. Let’s say that host A sends a broadcast frame. SW1 “tags” the frame by inserting the VLAN ID in the header of the frame before sending the frame to SW2. SW2 receives the frame and knows that the frame belongs to VLAN 3, so it sends the frame only to host D, since that host is in VLAN 3.